“OMG it’s back! What do you do when they won’t leave?” This was a text message I received from a friend who was boondocking with her husband and dog near Mount Shasta in Northern California on their way north to Alaska. A young black bear had woken them during the night and scratched up their truck while they were sleeping in their trailer. They had shouted and scared it off, but now, during the daylight, it had returned and was once again trying to get in their truck. “I feel like we are being watched!” The only answer I had to give them was to leave that campsite and let the ranger know about the little bear when they could. Although most people might enjoy glimpsing a bear while RVing through the forests, bear encounters while camping have the potential for turning very dangerous (to both humans and bears) quickly. Bears are large, fast, and generally hungry. They spend their time scavenging, looking for an easy meal, with their highly sensitive noses leading the way to smells that could potentially be food sources. If those smells lead a bear into your campsite, bears have the strength and speed to do significant damage to vehicles, trailers, and humans. Sadly, bears that learn to associate humans with potential food sources can be seriously dangerous, and usually the end result is that the bear is euthanized. Bears are much better off relying on their natural food sources, without human involvement. 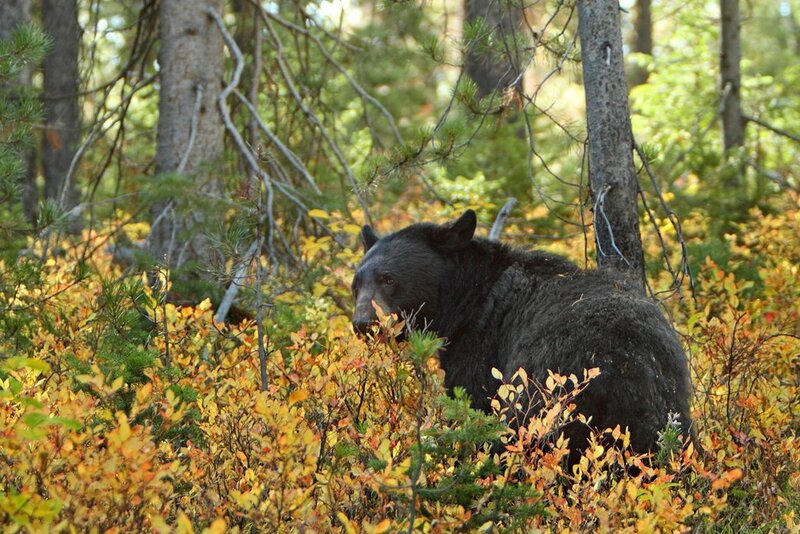 After talking with wildlife officers from both Colorado Parks and Wildlife and Alaska Fish and Game, these are some precautions and considerations for those RVing in bear country to keep in mind. Although adverse bear encounters with RVers are rare, anyone who is traveling in areas where bears may be, whether in the lower 48, Canada, or Alaska, should have a basic understanding of bear behavior and take appropriate actions to avoid having an unwanted bear encounter. Established campgrounds generally have hosts or rangers who work to educate visitors and know if problem bears are in the area. 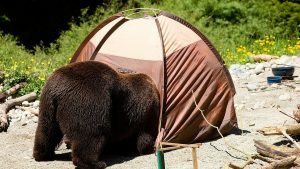 If you enjoy boondocking, it is up to you to be bear aware and prevent bears from finding their way into your area. Avoid camping near game trails and rivers that bears may use to minimize opportunities for encounters. A sloppy camp area not only endangers you but also anyone else who camps there in the future. Pick up your garbage, wash your dishes, wipe down tables, and don’t throw dishwater on the ground around your campsite. If you arrive at a campsite and notice bear tracks, droppings, or garbage scattered around the site, try and find another site. These are all signs that a bear may have learned to associate humans with food. Double bag your garbage and stored food to minimize food odors. If you gut fish, do it far, far away from human-occupied areas. Bears are most active during the early morning or evenings. For those who enjoy running or hiking, make sure you always have good sight lines and stay away from overgrown, brushy trails where you may surprise a foraging bear. The leading cause of bear attacks is the unexpected close proximity of people and bears. Bears may respond to this surprise by attacking. Make plenty of LOUD noises (“bear bells” are not enough—clapping, loud singing, shouting, shaking a can filled with pebbles, are better options) as you make your way to allow wildlife to know your location—again, avoiding surprise encounters. Be aware of your surroundings and avoid areas where bears may be (food source areas, areas of fresh kills, etc). If you are with children, keep them with your group and don’t allow them to run ahead or lag behind. Keep your dogs on a leash at all times and don’t leave them unattended. Dogs antagonize bears and can lead an angry bear back to you if they are off exploring on their own. Make sure you keep dog food in a secure location where bears cannot smell or find it. Don’t have your dog sleep outside, keep them in the RV with you at night. Don’t feed your dog around your RV, as sloppy eating can leave food odors around to attract bears. If you see a bear, NEVER approach it. Give the bear plenty of space. If you are around your campsite, calmly gather up anything that might attract the bear and get in your RV. Make loud noises by banging pots and pans, shouting, or honking the horn. Bears are generally shy and curious and should leave with all the commotion. If the bear does NOT leave, or makes contact with the RV, leave the area immediately. 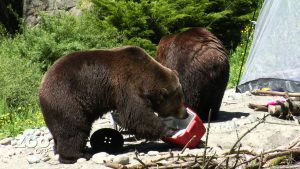 It is better for both humans and bears to relocate to another area further away than to risk having the bear associate humans with food sources. If you see a bear while away from the campsite (on a hike or run for example), don’t take your eyes off the bear, and move away if it has not already seen you. If the bear has noticed you, stand your ground and talk to it calmly so it knows you are human. If you see a bear, don’t take your eyes off it, and move away if it has not already seen you. Bears are curious, and if they don’t know what you are, they may come closer to investigate or stand on their hind legs to get a better look and smell. Try to appear larger by standing close to others in your group, opening up your jacket, or holding your arms above your head. Try to back away slowly, but if the bear follows you, STOP and hold your ground. Prepare your deterrent if you have one. Deterrents such as bear spray, flash-bangs, or firearms can be helpful but used only as a backup to common-sense approaches to avoiding bear encounters. Be SURE you have practiced with the deterrent method, and fully understand the limitations and use of the method. If you are inexperienced with a firearm, you may not be able to successfully use it in an emergency situation. A wounded bear is an even greater threat to human safety. If the bear continues to approach you, become more assertive. Raise your voice, make loud noises, throw rocks or sticks. Driving a bear off is better than allowing it to follow you. Do not climb a tree. You cannot out climb a bear. Do not run. You cannot outrun a bear. If you run, they may chase you down like prey. STAND YOUR GROUND. If a bear does make contact, you have two choices: playing dead or fighting back. Most often, bears attack out of a defensive response, so playing dead (lie flat on your stomach on the ground, legs spread apart for stability and hands protecting the back of your neck) is the best response. Remain motionless as long as possible. Moving may cause a bear to return or renew its attack. If it is a prolonged attack, or the bear perceives you as a potential food source, you should fight back with all you’ve got. Concentrate on the bear’s face or muzzle with anything you have on hand. Glimpsing well-behaved bears in their natural environment from a safe distance can be a highlight of any trip. Dangerous bear encounters are not common, and most bears are just curious animals looking for food. If you are not food (and not associated with food), they will most likely leave you alone. There is a BIG difference in how to react to a grizzly & a black, know the difference. I’ve been around blacks many time & unless it’s a female with cubs, I just chase it away. A grizzly scares me big time & I stay as far away as possible. You don’t fight a grizzly! !